"In the tales, you'll find a selchie story influenced by Solana Beach, CA; a tale of vampires inspired by parties I once went to in a dead-end town I won't name; a goblin encounter set in the woods where I once picked berries; and a tale of dark contentment in a mountain town that owes a debt of gratitude to a Violent Femmes song I love. Of course, you'll also spend time with the Wicked Lovely faeries who have lived in my head and my novels since 2004." Sexuality - Melissa Marr is one of the only YA authors I've seen who has consistently created protagonists who embrace their sexuality. Thank God for that. Writing - I love Marr's writing. It may not be what's usually considered poetic, but it always has this lush, atmospheric feel to it that draws you into her stories. Themes - Marr tends to play a lot with desire in her writing, but that works out really well with the kind of moods she creates. Worlds - Selchies. How many of you have read stories with selchies? I really liked how each and every one of these stories had a whole another world to it. I wanted to learn more and have her write novels based off the stories [exception: WL stories, 'cause there already are :)]. I feel the need to mention this. A lot of these stories have been published elsewhere--as in, you may have already read them. "Transition" (Vampires) <-- in the anthology Teeth. "Love Struck" (Selchies) <-- in the anthology Love is Hell. "Stopping Time" (WL World) <-- I think this was printed in the paperback copy of Ink Exchange, because I remember reading this somewhere. "Old Habits" (WL World) <-- Again, the same as with "Stopping Time." "Merely Mortal" (WL World) <-- in the anthology Enthralled: Paranormal Diversions. To me, it seems a little unfair that almost half this book has short stories that were published in other places first and now are compiled together for readers to buy in a $17.99 book. When I buy anthologies, it's usually because I love the authors and want to see new material from them. It was rather sad that I had already read so much of what's published in this anthology. BUT, if you haven't read a single Melissa Marr story, here's your chance. If you're wondering whether or not you'd like Wicked Lovely, here's your chance to sample some of Marr's other work. 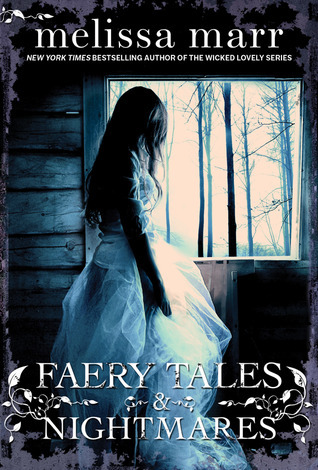 Marr's a great storyteller, and as with her other work, this shows in Faery Tales and Nightmares. I have had my eye on this. I posted it in this weeks new releases. I appreciate you mentioning the other places that some of these stories have been previously published.